1890s. 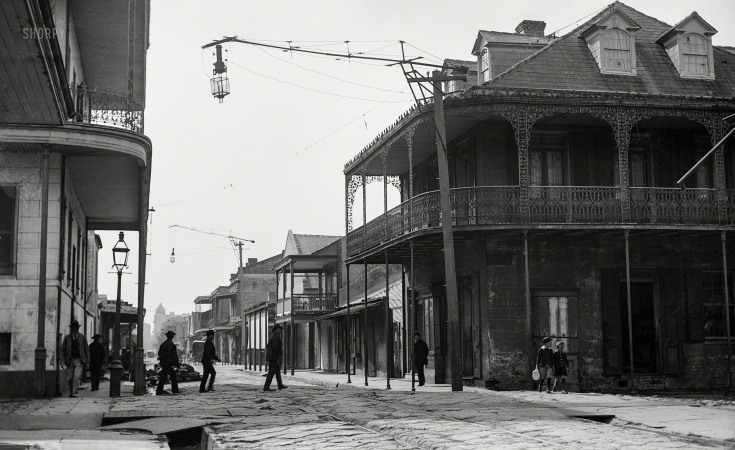 "The French Quarter, New Orleans." Its carbon arc lamps lighting the way to an electrified future. 19×13 inches on archival photo paper. Minimum one-inch margins: Image size for this photo on 19x13 paper is approximately 17 x 10 inches. Paper stock, chosen for best appearance, is Ilford Galerie Prestige Gold Fibre Silk (13 mil, 310 gsm, satin gloss finish, used for color photos and the darker monochrome images) and Epson Ultra-Smooth Fine Art (19 mil, 230 gsm, matte finish). 22×17 inches on archival photo paper. Minimum 1.5-inch margins: Image size for this photo on 22x17 paper is approximately 18.5 x 11.3 inches. Paper stock, chosen for best appearance, is Ilford Galerie Prestige Gold Fibre Silk (13 mil, 310 gsm, satin gloss finish, used for color photos and the darker monochrome images) and Epson Ultra-Smooth Fine Art (19 mil, 230 gsm, matte finish). Our most popular size: Compared to the same print on 19x13 inch paper, the 22x17 inch print is 62 percent bigger — about two-thirds larger. 30×24 INCH SPECIAL EDITION print on Moab Archival Photo Paper. Minimum 1.5-inch margins: Image size for this photo on 30x24 paper is approximately 26.5 x 16.2 inches. Moab Entrada Rag Natural Finish. Weight: 300 gsm; Thickness: 22.5 mil. Shipped in a heavy-duty 5-inch-diameter fiberboard canister. Please allow up to three weeks for printmaking and delivery. Compared to the same print on 22x17 inch paper, the 30x24 print is almost twice as large; almost three times the size of the 13x19. 69×44INCH SPECIAL EDITION XL-MAGNUM on PAPER or CANVAS. Image size for this photo is 65 x 40 inches. Printed with two-inch margins on the same 19-mil archival paper described above, or on traditional cotton gallery canvas -- the same as would be used for an oil painting. PLEASE NOTE: We supply only the printed canvas; you'll need to have your frame shop mount it on a stretcher. Please allow two to three weeks for printmaking and delivery. XL Magnum prints are special-order items and may be returned for exchange only.